The visceral experience of being connected to and embedded within something beyond the self. Like, when breathing air and understanding that this air connects and contains your body with everything else on this planet, through space and time. Ana Mendieta continually sought this kind of spiritual experience through her works. Concerned with her own displacement as a Cuban-American refugee migrant, she said of her work, "I believe this has been a direct result of my having been torn from my homeland during my adolescence. I am overwhelmed with the feeling of having been cast from the womb. My art is the way I re-establish the bonds that unite me to the universe." 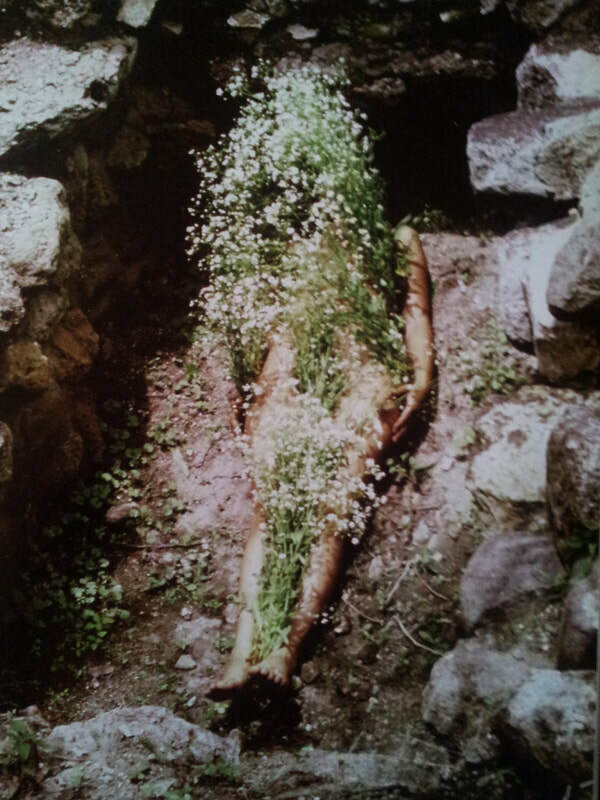 In Image from Yagul, her original siluetta performance, Ana uses flowers that hold a cultural significance to the peoples of Yagul, bringing a local specificity to her work. It is this tension of being displaced, desire for spiritual reconnection with land, and local specificity that I also seek to hold and communicate in this project. Image from Yagul by Ana Mendieta. 1973.